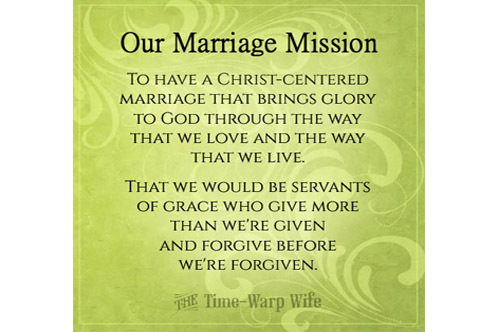 A marriage is two people on a life-long mission. Whether we notice it or not we all go into marriage with a goal or two in mind. And whatever that goal or mission is, will be different for every couple. The key is to have the same goal as your husband, and the master key is to have a goal that’s focused on the Lord. A few years ago, when I was setting up a website, a friend asked me what my “mission statement” was. I should probably mention that this guy was a branding expert. He worked with some of the biggest companies out there formulating mission statements, but even so he knew that a little writer like me could benefit from some focus. The thing I learned from him, is that a mission statement doesn’t just help you formulate a focus, it helps you to keep that focus.